lost in transition: Ride hard. Cause chaos. My uncle and aunt have a gorgeous house in West Kelowna overlooking Lake Okanagan, and each summer the Frank Family Summer Vacation descends upon it. Note, I did not say "rest and relaxation", because this family tradition has a history of being nothing less than a tornado of destruction. Unforeseen disaster is the name of the game, and the Frank family plays it well. In fact, this year we arrived to find that my aunt and uncle's home is up for sale, and I am fairly certain that it is the Frank Family Summer Vacation that has driven them to such drastic measures. When they fail to send any of us their forwarding address, we will know for sure. Aside from its longstanding mission to cause the maximum amount of disruption in the minimum amount of time, the Frank Family Summer Vacation 2012 had two specific directives: celebration of my mom's birthday (ice cream cake!! ), and the RBC Kelowna Gran Fondo. 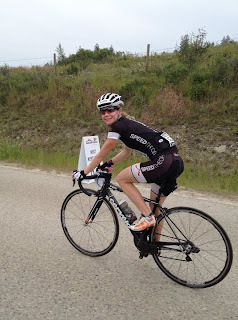 And, no, I did not make my mom ride the fondo for her birthday. This year's pilgrimage started off in excellent Frank Family Summer Vacation form. I caught a ride with my sister and her family, aka auntie-in-the-middle. Add extra excitement for the fact that not only was I traveling with a 2-year old and two dogs, but the back window of my brother in law's SUV had been smashed out that morning, requiring a plastic patch job upon departure. Joey: Where are we going? Richele: To see gramma and grampa. Richele: To go swimming in the lake. Richele: Why do you ask why so much? Richele (pointing): Look at the nice (insert here: train, car, tunnel, squirrel, valium), Joey! Joey (attention momentarily diverted from the why game). At any rate, I digress. But it is always interesting. This was my second year riding the Kelowna fondo and I continue to have the view that the organizers put on a first-class event. I absolutely love it as an opportunity to do an all-out catered training effort, essentially on a closed course! Unlike the larger Penticton and Whistler rides, this event is accessible, not congested and more low-key but has the benefit of being a really challenging ride. The course winds north of Kelowna along the lake, climbs an absolutely wicked hill to the top of Predator Ridge, through Vernon, and then winds its way along the lakes back to Kelowna. Wicked good fun! Last year, I had some "technical difficulties" on course (aka, I was steered off course and ended up riding a little extra), so this year I was resolved to stay in one of the front packs and put up a good time. With the help of my new climbing machine Rosey and the added incentive of a 7 km “climb to royalty” at Predator Ridge, it was a fast ride. Best of all, my aunt and uncle's home is miraculously still standing after yet another successful Frank Family Summer Vacation. Again, we proved that there is nothing that a few band-aids, some alcoholic beverages and a top-to-bottom house cleaning cannot fix. And, unlike 2011, no mice lost their lives. So....anyone in Kelowna interested in hosting the Frank Family Summer Vacation, version 2013? Thanks to Speed Theory Vancouver and Murray for building me one hell of a climbing machine, to Steph and the others from team lululemon for motivating me to ride hard out there and to other awesome riders I spent my day with!